Although the scare behind the consumption of fats and cholesterol has declined in recent years, and the research pointing the finger at sugar instead of fat as being the food that is most linked with disease, there is no argument about the fact that excess cholesterol and fats in the diet are still well-known risk factors for heart disease, higher levels of belly (visceral) fat that leads to inflammation and lowered quality of life as well as a shortened lifespan. Cholesterol is produced in the liver and has some critical functions including keeping the cell membranes flexible, taking part in the production of steroid hormones, in vitamin D production, and bile acid production that helps us digest our food. We do not need to eat foods that contain any cholesterol. The body will produce all the cholesterol it needs. In the modern world, we tend to consume too many foods that are very high in cholesterol, saturated fats and trans fats which change cholesterol balance leading to detrimental effects on health. Cholesterol balance in the body is also under the control of epigenetic mechanisms which are passed on from our parents or change as a result of faulty lifestyle habits. The good news is that there are ways to reduce your cholesterol levels with a change in diet and different lifestyle choices, and by taking specific supplements that help reduce cholesterol in the blood and reverse the damage caused by excess cholesterol and fats in the blood. Due to previous bad dietary advice, many people still assume that all fats are unhealthy, and they try to avoid them. However, the truth is that certain fats are very healthy and even essential to life, whereas others are not. Unsaturated fats, including both mono-unsaturated and poly-unsaturated fats, are most beneficial to health. A diet that includes certain unsaturated fats is much better than a diet based on having as little fats as possible. In healthy individuals, about 30% of blood cholesterol, along with other fats, is carried by High-density lipoprotein (HDL). Lipoproteins are required to transport fat molecules around the body within the blood because they are fat soluble and cannot otherwise move in the water-soluble blood. They typically carry hundreds of fat molecules around the body. This is often contrasted with the amount of cholesterol estimated to be carried within low-density lipoprotein particles (LDL). LDL moves fats and cholesterol LDL to the cells. Therefore, high-density lipoprotein (HDL) is beneficial for health while high levels of low-density lipoprotein (LDL) will leads to the health risks involved in high cholesterol diets and cholesterol-induced health issues. The cholesterol inside these lipoproteins is the same in both HDL and LDL carriers, but their destination makes all the difference. Unsaturated fats from the diet, especially monounsaturated fats raise HDL levels and help remove excess cholesterol from the arteries and the blood, whereas LDL takes the cholesterol to the cells where it can oxidize within the artery walls leading to atherosclerosis. Monounsaturated fats are found in olives, olive oil, avocados, almonds, walnuts, cashews, and a few other types of tree nuts. Omega-3 fats can be taken in plant-based supplement form but are also found in chia and flax seeds as well as tree nuts especially walnuts. Scientists from the National Institutes of Health (NIH) analyzed human and mouse epigenome and found that drinking alcohol could lead to epigenetic changes that influence the bodies ability to regulate cholesterol. Although previous studies found that low levels of red wine are protective against heart disease due to their high antioxidant activity, since alcohol is metabolized by the liver and can cause liver damage if used in large amounts it will have a negative effect cholesterol regulation. Soluble fiber is very beneficial at lowering cholesterol levels as it reduces the absorption of cholesterol into your bloodstream. But not only that, high levels of fiber in the diet are essential for the livelihood of a healthy microbiome. The good bacteria living in your intestines can digest this fiber which our bodies can’t, and these bacteria subsequently reduce the levels of cholesterol and lower risk of disease. Sources rich in fiber include plants like beans, peas, lentils, fruit, Brussels sprouts, and whole grains. Coenzyme Q10 – common in animals and most bacteria, it helps cells produce energy and is found in the body in regular amounts. However, additional Q10 has shown to help reduce the total amount of cholesterol in the body. 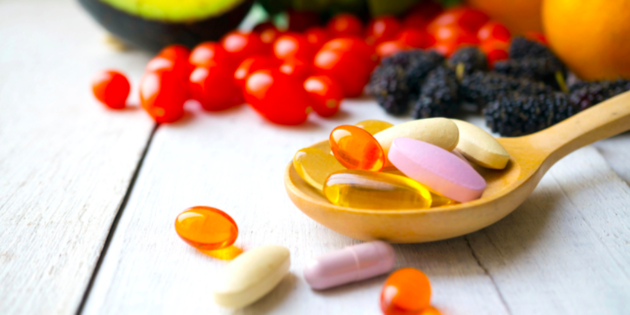 Coenzyme Q10 can be taken in the form of supplements or can be consumed through foods that are rich in this coenzyme including spinach, cauliflower, broccoli, strawberries, oranges, soybeans, lentils, and peanuts. Artichoke leaf extract – A study showed that participants who took an artichoke supplement for six weeks saw their levels of low-density lipoprotein (LDL), fall by 18.5%, compared to just 8.6% in the placebo group. Niacin – or vitamin B3 has shown to positively affect high LDL cholesterol, high non-HDL cholesterol, high levels of triglycerides, and reduced HDL levels. Vitamin B3 has also been proven to have anti-inflammatory and anti-atherosclerotic effects. But taking excessive amounts of this vitamin regularly will result in side effects such as skin flushing and even to liver damage. Not all fats are equal. Evidence shows that we need to reduce LDL levels by eliminating foods with harmful fats and taking in those with good fats. Additionally, lowering alcohol consumption and taking different supplements and regular intake of fiber can help you reduce the amounts of overall cholesterol leading to more oxygen-rich blood reaching your organs and supplying them with the critical nutrients they need to thrive. Eaton SB. Humans, lipids and evolution. Lipids. 1992 Oct;27(10):814-20. Review. PubMed PMID: 1435101. Jones PJ, Pappu AS, Hatcher L, Li ZC, Illingworth DR, Connor WE. Dietary cholesterol feeding suppresses human cholesterol synthesis measured by deuterium incorporation and urinary mevalonic acid levels. Arterioscler Thromb Vasc Biol. 1996 Oct;16(10):1222-8. Adding monounsaturated fatty acids to a dietary portfolio of cholesterol-lowering foods in hypercholesterolemia. Jenkins DJ, Chiavaroli L, Wong JM, Kendall C, Lewis GF, Vidgen E, Connelly PW, Leiter LA, Josse RG, Lamarche B. CMAJ. 2010 Dec 14;182(18):1961-7. doi: 10.1503/cmaj.092128. Protective effect of dietary monounsaturated fat on arteriosclerosis: beyond cholesterol. Pérez-Jiménez F, López-Miranda J, Mata P. Atherosclerosis. 2002 Aug;163(2):385-98. Exchanging a few commercial, regularly consumed food items with improved fat quality reduces total cholesterol and LDL-cholesterol: a double-blind, randomized controlled trial. Ulven SM1, Leder L, Elind E, Ottestad I, Christensen JJ, Telle-Hansen VH, Skjetne AJ, Rafael E, Sheikh NA, Holck M, Torvik K, Lamglait A, Thyholt K, Byfuglien MG, Granlund L, Andersen LF, Holven KB. Br J Nutr. 2016 Oct;116(8):1383-1393. Epub 2016 Oct 14. Effects on coronary heart disease of increasing polyunsaturated fat in place of saturated fat: a systematic review and meta-analysis of randomized controlled trials. Mozaffarian D, Micha R, Wallace S. PLoS Med. 2010 Mar 23;7(3):e1000252. doi: 10.1371/journal.pmed.1000252. McNamara DJ. Dietary cholesterol and the optimal diet for reducing risk of atherosclerosis. Can J Cardiol. 1995 Oct;11 Suppl G:123G-126G. Review. PubMed PMID: 7585286. Effects of a carbohydrate-restricted diet with and without supplemental soluble fiber on plasma low-density lipoprotein cholesterol and other clinical markers of cardiovascular risk. Wood RJ, Fernandez ML, Sharman MJ, Silvestre R, Greene CM, Zern TL, Shrestha S, Judelson DA, Gomez AL, Kraemer WJ, Volek JS. Metabolism. 2007 Jan;56(1):58-67. Association between dietary fiber and lower risk of all-cause mortality: a meta-analysis of cohort studies. Yang Y, Zhao LG, Wu QJ, Ma X, Xiang YB. Am J Epidemiol. 2015 Jan 15;181(2):83-91. doi: 10.1093/aje/kwu257. Epub 2014 Dec 31. Long-term cholesterol-lowering effects of psyllium as an adjunct to diet therapy in the treatment of hypercholesterolemia. Anderson JW, Davidson MH, Blonde L, Brown WV, Howard WJ, Ginsberg H, Allgood LD, Weingand KW. Am J Clin Nutr. 2000 Jun;71(6):1433-8. Supplementation with coenzyme Q10 reduces plasma lipoprotein(a) concentrations but not other lipid indices: A systematic review and meta-analysis. Sahebkar A, Simental-Mendía LE, Stefanutti C, Pirro M. Pharmacol Res. 2016 Mar;105:198-209. doi: 10.1016/j.phrs.2016.01.030. Epub 2016 Feb 2. Varshney R, Budoff MJ. Garlic and Heart Disease. J Nutr. 2016 Feb;146(2):416S-421S. doi: 10.3945/jn.114.202333. Julius U. Niacin as antidyslipidemic drug. Can J Physiol Pharmacol. 2015 Dec;93(12):1043-54. doi: 10.1139/cjpp-2014-0478.